The ‘Shreeshwasam’ – ‘The Healing Code of the universe’, is the supreme gift given by the Mother of the universe, Adimata to Her beloved children. The universe is wholly pervaded by ‘The Healing Power’ (Nirogikaran Shakti) of Adimata. This power which is called ‘The Universal Healing Power’ as also the ‘Arula’, is the pure compassion and unmerited grace of Adimata. To make this power of Arula available to Shraddhavans did Sadguru Shri Aniruddha organized the auspicious Shreeshwasam Utsav. – The one that brought welfare and progress of humanity in all aspects. – The one that made the lives of Shraddhavaans successful and wonderful and brought about pure and transformations in them. – The one that eradicated the grief or trouble caused by the obstructions in the five faculties of knowledge (Pancha Dnyanendriya), five faculties of action (Pancha Karmendriya), and Mana (mind) being the 11th, pradnya (intellect) being the 12th as well as 12 channels and offering good health and prosperity to all humanity. Explaining briefly about Shreeshwasam, Sadguru Shri Aniruddha said, “Shreeshwasam is his resolve. It is the active respiration of Mata Jagdamba. To cite an example, the way an injury gets healed by applying an ointment, the same way, Shreeshwasam is the grace bestowed by Adimata and her son that allows us to overcome all our shortcomings and weaknesses and grants us only the appropriate according to our capacity. A mother breathes for the child in her womb, and all the nutrients essential for the baby are delivered through her umbilical cord at the same time it is she who accepts all that is harmful to her baby. Adimata’s modus operandi works similarly. The cord that connects us to Adimata is Trivikram. Further, Sadguru Shree Aniruddha elucidated about the greatness of this undertaking saying, “If Shree Shwasam becomes the breath of our spiritual life, our life would intuitively become beautiful. The way we improve our health with Shree Shwasam, we must also strive to improve the wellness of the whole world and thus, we should call upon Adimata and request Her to keep the nature ever healthy.” This reiterates the fact that Shree Shwasam is not only for an individual alone, but also for his family, city, religion, nation, and motherland and for every good-hearted life form in this world. 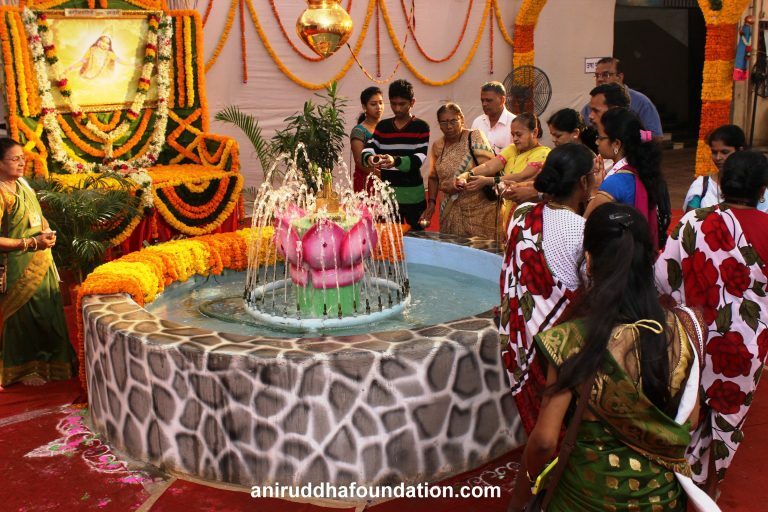 Under the guidance of Sadguru Shri Aniruddha, the noteworthy Shree Shwasam Utsav was conducted successfully with overwhelming enthusiasm and unprecedented attendance at Shri Harigurugram, Bandra (New English School) during May 4, 2015, to May 10, 2015. 1) On the main stage, there were huge and beautiful images of Chandikakul and Anjana Mata carrying a young Hanumanta on her lap, on one side and the other side of the stage was placed, Shatakshi Mata’s image (Shakambhari Mata), which were worshipped during this Utsav. 2) The open ground before the stage had a Parikrama-kaksha (chamber meant for circumambulation), where 25 pictures were arranged in a way that leads Shraddhavaans to the main stage after taking its darshan. Sadguru Aniruddha had uncovered these pictures by worshipping and offering a tender Shahale (tender coconut), Gahu (wheat) and flower- garland. Mahavishnu, with an engraved Kurma(tortoise) on its back. 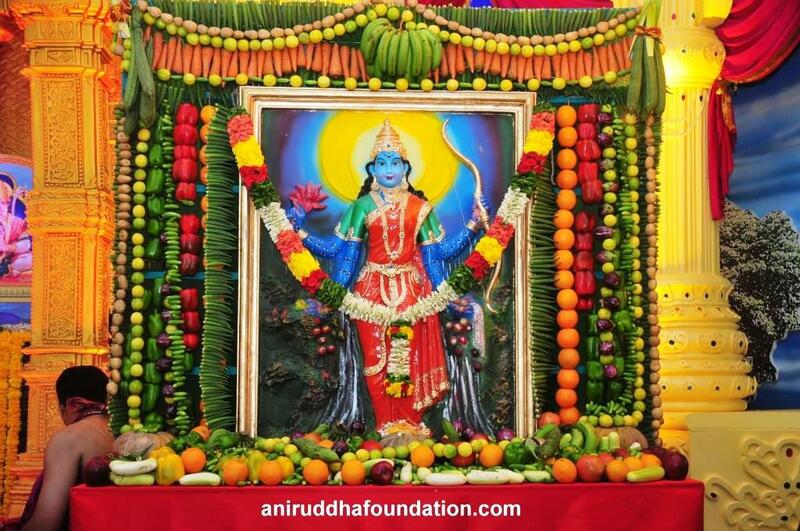 The picture of this Kurm was placed near Adimata’s feet on the main stage. The Shri Yantra etched on this Kurm’s back is considered extremely auspicious. 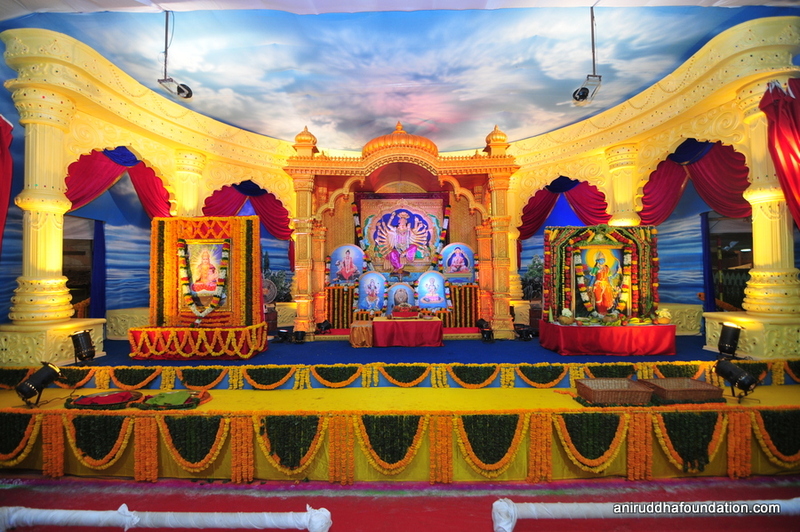 3) The hall situated to the left of the main stage housed the Mahapran Hanumanta’s idol on one side and in the next were two idols of Ashwini Kumar which were also unveiled by Sadguru Shri Aniruddha. 4) The ‘Usha Pushkarini Kund’ was placed on the other side of the hall. A Trivikram idol made from Panchadhatu (five basic metals) was erected in the water-filled kund. Sadguru Shri Aniruddha inaugurated both the Trivikram idol and Usha Devi’s picture after performing its worship. 1) Jogawa Parikrama –Before heading towards the Jogawa Parikrama (circumambulation), Shraddhavans were applied Naam on their forehead. When the Sshraddhavans entered the hall, before starting the parikrama, they were handed a paper with a sketch of a Mooshak (Lord Ganpati’s vehicle or carrier – Mouse). 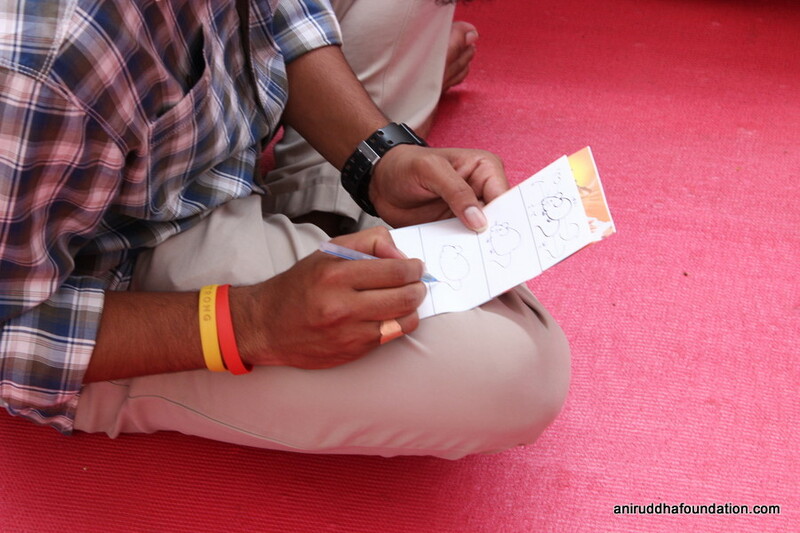 The Shraddhavans were asked to draw three Mooshaks. Let us first reiterate the importance of the Mooshak as told by Sadguru Shri Aniruddha and then proceed to the Jogawa Parikrama. Offerings to Adimata included daal and rice grains, three bananas and some leaves, which were carried by the Shraddhavans for the Jogawa Parikrama. This offering entirely depended on the willingness of the Shraddhavans. Some considered themselves fortunate to participate in the Parikrama merely. They sought the darshan of the various forms of Adimata, through the images placed in a particular sequence during the Parikrama. The echoes of ‘Jai Jagadamb Jai Durge’, ‘Om Namahchandikayai’, ’Aai you are loving, and I am Ambadnya’, ’O Sadguru, you are loving, and I am Ambadnya’ were heard all throughout. The Parikrama concluded with darshan of Trivikram. The Shraddhavans, on completing the Parikrama, felt a steadfast assurance that ‘Trivikram is the whole and sole support of their life!’. A Jalakunda was placed ahead, wherein two bananas were offered to Adimata from the rice and pulses which Shraddhavans were carrying in a winnowing basket or a sort of scuttle. The pulses and rice grains were donated to the needy, through the Annapurna Prasadam Yojana, running under the aegis of Sadguru Shri Aniruddha Foundation. Out of the three bananas, the remaining one was given to Shraddhavans as prasad. On completing the parikrama, the Shraddhavans, would seek blessings from the Chandikakul on the main stage and Shatakshi Mata (Goddess Shakambhari) placed adjacent to it on one side and the loving and nurturing form of Anjana Mata with a young Hanuman sitting on her lap, on the other. Importance of Shatakshi Mata (Goddess Shakambhari) – As described by Sadguru Shri Aniruddha in ‘Matruvatsalya Vindanam’ – ‘Seeing the terrible plight of humans caused by the hundred years of drought, Maharshi Agastya and other maharishis called out to Mata ‘Paramba’ wholeheartedly, by singing Her glories. Chandika Mata then, Herself appeared before them. All Maharshis chanted Her praisings in unison and prayed, ‘O Chandika Mata, Kindly set aside your fiery ‘Ran-Ragini’ form and bless Your children on earth with motherly compassion. Adhering to the noble request of the sages, Adimata assumed a soothing and benign form. This delightful form of Adimata had a hundred eyes, and hence, She was named as ‘Shatakshi (Goddess with hundred eyes)’. She carries a tender-leafy branch, flower, fruit, roots, Akshay Jalpatra, bow, arrow and a plough in her hand. With Her hundred eyes, Shatakshi Mata looked upon the earth with compassion, and the earth became green and fertile again. Upon witnessing Her grace and glory, Agastya Rishi conferred the names Shakambari Annada and Neeldurga to her. The photograph of this illustrious Shatakshi Mata adorned the main stage in the ‘Shree Shwasam’ Utsav. Sadguru Shri Aniruddha hailed Shakambhari Mata with the prayer to keep our earth irrigated, fertile and prosperous (Sujalam, Sufalam and Samruddha). Soldiers and farmers – the pillars of the nation should prosper, was a generous emotion behind the ‘Shree Shwasam’ Utsav. Recitation of Moolark Ganesh Mantra, Shri Dattatreya Stotram, Shri Suktam, Panchamukh Hanuman Stotra, Ashwini Kumar Sukta and Usha Sukta were continuously being done while Shraddhavans were steadily moving ahead for darshan. With the above recitations, Trivikram Gayatri Mantra was also chanted. The atmosphere left the Shraddhavans wholly drenched in the sweet nectar of devotion. Shraddhavans would pass under the jhal, a form of Adimata’s blessing (represented by a holy cloth), which was erected at two points, one being just before the stage and the other at its exit after the darshan. As explained by Sadguru Shri Aniruddha in his discourse, the Jhal is nothing but Mata Chandika’s pallu – the loose end of the saree that shelters every Shraddhavan. 2) Guhyasuktam Parikrama – The hall to the left of the main stage had idols of Panchamukha Hanumanta and Ashwini Kumars where Shraddhavans were to perform a Parikrama(circumambulation) with a small kalash of holy water The water was brought from the rivers of Tapi, Indrayani and Panjara. Shraddhavans performed this Parikrama holding the kalash in the left hand from below, covering the mouth of the kalash with right palm and listening to the Guhyasuktam. This was the prime attraction of the event. Nowadays, it is observed that the condition of a person has been deteriorating not only at the physical level but also at the mental and intellectual. The need for ‘Healing’ is ardently felt in various levels of life such as relationships, jobs-businesses, family life, education, finances, etc. This healing is required and is indispensable for every individual, society, country and the world. Just as a baby in mother’s womb simply listens and his mother’s breathing moves throughout his body, the Shraddhavaans too need to listen to the Guhyasuktam attentively. When Shraddhavans listen to the Healing Code and breathe out normally, they exhale all their ailments, vices and evil and, Adimata accepts all, inhales it and exhales the healing power, which Shraddhavans breathe in. Shraddhavans attained the highest pinnacle of contentment by receiving this greatest gift of Guhyasuktam given by Bapu. This Guhyasuktam is ‘The universal healing code’, listening to which loving words and rhythm provided heavenly harmony, ease, content and satisfaction to Shraddhavans. They realized that every word and syllable of Guhyasuktam was healing them. This healing energy (power) of Adimata that encompasses the entire universe was showered generously upon Shraddhavaans at the event. Shraddhavaans proceeded with the parikrama with the belief that the journey of their life is being directed by Trivikram the same way as that of the Vigat in the Matruvatsalya Upanishad, written by Sadguru Shri Aniruddha. When should one listen to the Guhyasuktam? In the moment of happiness to double the joy, at the time of sorrow to soothe the grief, every day in the morning for a cheerful start and at every night for a peaceful sleep. Also, one can listen to it during sickness also for a quick recovery. The CDs of GuhyaSuktam in Marathi, Hindi, English and Sanskrit are available. 3) Samarpan Parikrama – After performing the Guhyasuktam Pradakshina at least for thrice, Shraddhavans offered the holy-water from the kalash to Usha Devi and Trivikram, by looking at their idols placed at the other end of the hall near the ‘Pushkarini Teertha’. 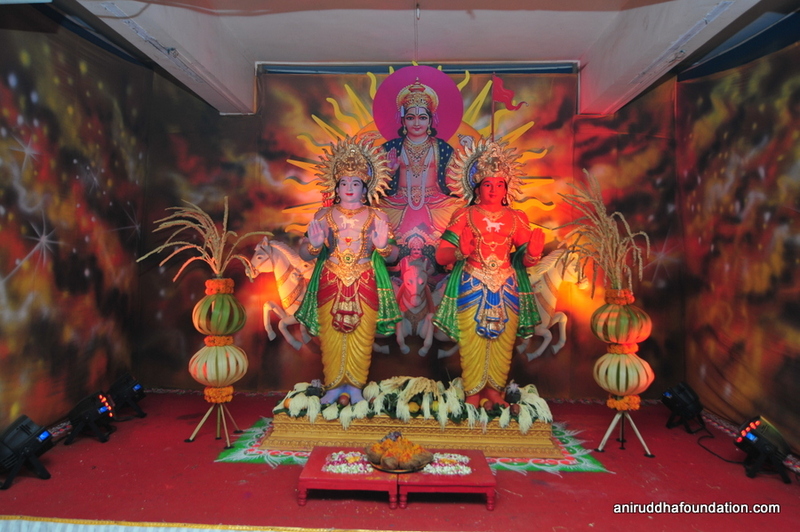 The ‘Sapta Chakra Swamini Mahapujan’ in front of the image of Mothi Aai (Mata Chandika) was made available at the ’Uttar Bhartiya Sangh Hall’- close to Shri Harigurugram (New English School, Bandra). After this Mahapujan, the Shraddhavaan had to return to the main stage at Shri Harigurugram to offer flowers, vegetables and fruits to Shatakshi Devi (Shakambhari Devi) and a blouse piece to Anjana Mata. This would ensure the grace and blessings of the holy undertaking. This Pooja was not mandatory and was to be conducted out of the Shraddhavan’s willingness. 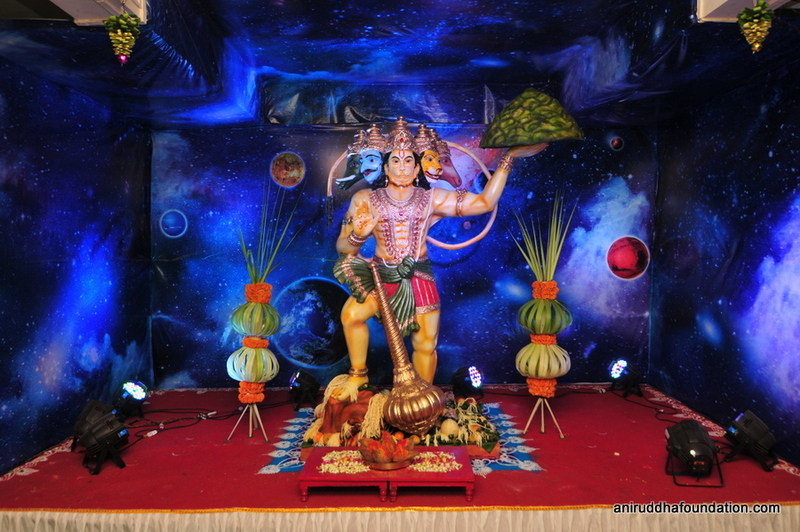 At 8:00 am in the morning, at noon and 8:00 pm, the deities on the stage were worshipped, and Mahanaivedya was offered at 1:00 pm in the afternoon and at 8:00 pm at night amidst the beats of auspicious traditional instruments. It was indeed an excellent celebration! 1) The universal healing power – The power of Arula was made available to Shraddhavan by the medium of Guhyasuktam without efforts or expense. This is an extraordinary gift of Adimata and Sadguru Shri Aniruddha. 2) It is a medium of eradicating the hazards of past karma. This confidence echoes in every Shraddhavan because their Sadguru Shri Aniruddha so promises it. 3) ‘Shree Shwasam’ pervades across all re-incarnations as is promised by Sadguru Shri Aniruddha, the only condition being ‘Complete Faith’. 5) ‘Shree Shwasam’ heals twelve kinds of sufferings or demons. The detailed information regarding the same is written in ‘Shri Shwasam Guhyasooktam’. 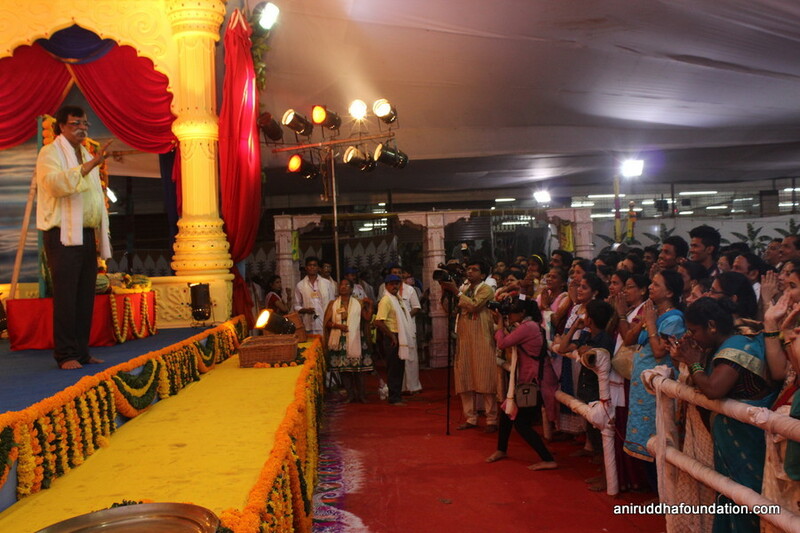 * Sadguru Shri Aniruddha concluded this festival with the ‘Vishwarpan Kalash’ ceremony. At the ceremony, Sadguru Shri Aniruddha urged all the Shraddhavans to remember the ‘breath’ that was granted to them. ‘I have forever given my breath to you’, these affectionate words of Sadguru Shri Aniruddha left all Shraddhavans with a feeling of ultimate fulfilment. Fortified with tremendous satisfaction, an elated mind, this wonderfully joyous celebration reached its completion.